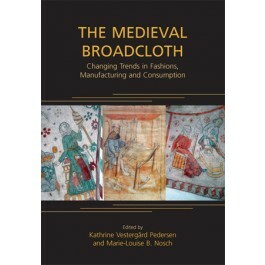 The eight papers presented here provide a useful introduction to medieval broadcloth, and an up-to-date synthesis of current research. The word broadcloth is nowadays used as an overall term for the woven textiles mass-produced and exported all over Europe. It was first produced in Flanders as a luxurious cloth from the 11th century and throughout the medieval period. Broadcloth is the English term, Laken in Flemish, Tuch in German, Drap in French, Klæde in the Scandinavian languages and Verka in Finish. As the concept of broadcloth has deriving from the written sources it cannot directly be identified in the archaeological textiles and therefore the topic of medieval broadcloth is very suitable as an interdisciplinary theme. The first chapter (John Munro) presents an introduction to the subject and takes the reader through the manufacturing and economic importance of the medieval broadcloth as a luxury item. Chapter two (Carsten Jahnke) describes trade in the Baltic Sea area, detailing production standards, shipping and prices. Chapters three, four and five (Heini Kirjavainen, Riina Rammo and Jerzy Maik) deal with archaeological textiles excavated in the Baltic, Finland and Poland. Chapters six and seven (Camilla Luise Dahl and Kathrine Vestergård Pedersen) concern the problems of combining the terminology from the written sources with archaeological textiles. The last chapter reports on an ongoing reconstruction project; at the open air museum in Eindhoven, Holland, Anton Reurink has tried to recreate a medieval broadcloth based on written and historical sources. During the last few years he has reconstructed the tool for preparing and spinning wool, and a group of spinners has produced a yarn of the right quality. He subsequently wove approximately 20 metres of cloth and conducted the first experiment with foot-fulling.